The taskbar in Windows 7 is a revamped combination of the previous Quick Launch and Vista's taskbar, but if you really, really miss Quick Launch, then keep reading. 1. First, right-click on the taskbar and turn off "Lock the Taskbar." 2. 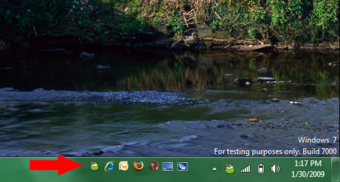 Right-click the taskbar, hover over Toolbars, and select New Toolbar. 4. Find Quick Launch (it may be on the right side of the taskbar), right-click the divider and disable "Show Text" and "Show Title." Make sure "Small Icons" is enabled. 5. Drag the divider to rearrange Quick Launch on your taskbar (using left-click). 6. Right-click and lock your toolbar again.